Free ranging chooks can fulfil various roles in the home backyard. They can help to control insects and weeds, provide fertiliser, lay eggs, eat food scraps, loosen the soil while scratching and are great pets. 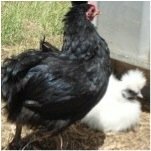 Many breeds of chickens are available with a range of characteristics. Some are bred for their looks and others for their meat quality or egg production. Ideally purchase your hens at point of lay (16-24 weeks depending on the time of year) and make sure you purchase them from a reliable source to ensure happy and healthy birds. It is extremely important to ensure that your chook house is rat, mice and fox proof (there are just as many foxes in the suburbs as rural areas). It should be fully enclosed with a fox proof door, roof and floor. Unless your chook house has a concrete, brick or paved floor the sides should be dug in to the ground at least 50cm as a minimum to deter foxes from digging under. You must lock your chooks up every night to keep them safe. If possible face the chook house north to take advantage of the winter sun and so that the back provides protection against strong wind and rain during winter. Make sure it is easily accessible with adequate ventilation, feeders and water. Make sure the chook house is designed so that it can be left unattended for several days if necessary without the birds suffering in any way. Cover the floor with approximately 8cm of sawdust, straw etc which mixes with the poultry droppings to form deep litter over a period of months. This litter can them be removed and used as garden fertiliser. 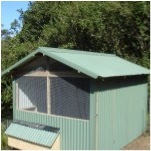 Your chook house should also contain a perch for roosting and a nesting box which can be emptied from the outside. We welcome you to Contact Us online or phone Greg on 0431 382 230 with your enquiry today. Getting Ready to Plant Your Autumn Vegetable Garden?